As the second chapter of director Park Chan-wook's "Revenge Trilogy", Oldboy (2003) earned the South Korean director plenty of respect in his home country and abroad. Based on the popular manga series by Tsuchiya Garon and Minegishi Nobuaki (which has since been translated into English and released by Dark Horse Comics), Oldboy is as chillingly focused as it is clinically detached. Told in a fractured but linear style, this violent tale of revenge is more than just a graphic psychological thriller---and though the film isn't without a few faults, it's tough to keep Oldboy from digging under your skin and staying there. 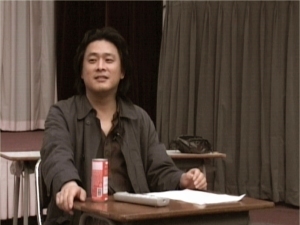 Our protagonist is Dae-su Oh (played by Choi Min-sik), a businessman, husband and father hauled in to the local police station after a drunken night on the town. He's bailed out by a friend; on the way home, he stops to make a phone call and disappears without a trace. Dae-su wakes up in a hotel room---a prison, once he realizes there's no escape---and the days and months slowly pass. He's fed the same fried dumplings every day and keeps himself busy by writing, punching the walls and watching television. While he's stuck inside, Dae-su learns that his wife's been murdered and his daughter's been sent to live with foster parents; sadly enough, he's the main suspect for the crime. After fifteen years in the same room, Dae-su is finally released. His only possessions are a new suit, a cell phone, his prison diary and a bit of money. The unknown kidnapper eventually contacts him, challenging Dae-su to uncover his identity and reason for imprisonment within five days. If he succeeds, the kidnapper will kill himself. What follows, of course, is the reason that Oldboy is considered part of the director's "Revenge Trilogy". Though the story is strictly over-the-top in almost every sense of the word, there's a balance to this intensity that keeps things grounded. Most casual fans of Oldboy probably remember it for a few scenes and elements: the tooth extraction, the live octopus, the hallway fight and a few others. Yet it's the strong atmosphere and blistering lead performance by Choi Min-sik that help elevate Oldboy to the cult classic it's quickly become. Sure, it's a grim and tragic tale filled with cynicism and anger, but it's also an extremely polished character study in its own right. Of course, one of Oldboy's biggest strengths---its over-the-top story, largely kept grounded---is also one of its sole weaknesses, though it's a relatively minor complaint. The kidnapper's plan and its subsequent execution almost require a complete suspension of disbelief, largely in how pitch-perfect it plays out for the mystery man. We're simply supposed to believe that he's an incredibly smart, incredibly organized criminal who's devoted roughly two decades of his life to making one man suffer. Still, there's a moral to the story: both men have fallen victim to the revenge reflex, which ends up costing them much more than their families, friends and free time. The story is told in such a focused yet open-ended fashion that the minor flaws are tucked away neatly; even so, you'll be sucked in to Oldboy for everything it does exactly right. Of course, most fans of Oldboy have already forgiven its minor faults, as it takes a devoted follower of any film to consider a DVD double-dip. Tartan's original release of Oldboy was a decent one-disc release but paled in comparison to deluxe editions offered overseas; luckily, this three-disc upgrade gives Region 1 fans an easier way to get a more complete package. Combining an excellent technical presentation with a host of bonus features (all of which are offered on the overseas releases, for those wondering), this three-disc package is a well-rounded effort and an excellent value. 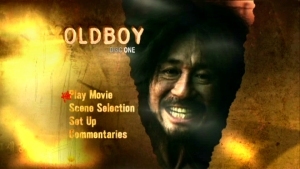 Presented in its original 2.35:1 aspect ratio and enhanced for 16x9 displays, Oldboy appears to have the same transfer as the original Region 1 release. The color palette and black levels are excellent overall, while the transfer seems to be free of dirt, debris and edge enhancement. The only minor problem is a mild amount of digital combing (also present on the previous release), which may not be as noticeable on certain displays. It's a minor problem, all things considered, but one that keeps Oldboy from receiving a higher rating. The audio presentation is a bit closer to reference quality, as long as you stick with an original language track. Included here are two excellent Korean mixes---both 6.1 DTS-ES and a Dolby Digital 5.1 track---which pack quite a punch from start to finish. There's an incredible amount of atmosphere during Oldboy, supported greatly by plenty of help from the rear channels and subwoofer. The English 5.1 dub, on the other hand, drowns out much of the atmosphere in favor of the font channels, while the voice acting isn't particularly convincing either. Optional English and Spanish subtitles are included for the main feature, while many of the extras include non-removable English subs. Seen above, the menu designs look nice and feature smooth, simple navigation. The 120-minute main feature has been divided into a scant 16 chapters, while no obvious layer change was detected during playback. The packaging is especially impressive, even considering the exterior is a direct rip-off of HBO's Band of Brothers. Each of the three discs is housed in its own slim digipak case, which stack neatly inside the outer metal tin (although a fold-out case might've been easier to handle). Also tucked inside are a few extra goodies, which are covered in more detail below. Though I don't normally rant against these things, one major nitpick about the presentation is the forced Tartan Extreme trailer that has been tacked onto all three discs. This trailer, which runs for roughly a minute and a half, is not skippable and becomes annoying very quickly. Here's hoping that it doesn't become a habit. Spread neatly across all three discs, the extras included here put the original Region 1 release to shame. First up are a trio of full-length Audio Commentaries, featuring a solo track by director Park Chan-wook, one with Park and cinematographer Chung Chung-hoon, and a third with Park and actors Choi Min-sik, Yoo Ji-tae and Gang Hye-jung. Amazingly enough, Park doesn't seem to overlap himself much during all three tracks, which are presented in Korean with optional English subtitles. He's more of a moderator during both of the group commentaries, though he coaxes many interesting stories out of the cast and crew members. Overall, all three are worth listening to, though casual fans should get their fill with the director/actor track. Disc 2 is next; like the first, it's roughly identical to the Region 2 Special Edition. First up is a nice collection of Behind-the-Scenes Featurettes (5 sections, 1:11:38 total), including "Making the Film", "Production Design", "The Music Score", "CGI Effects" (below left) and "Flashback", which range from 10 to 23 minutes apiece. Featuring plenty of interviews with cast and crew members, it's a great way to be caught up with those who didn't participate in the audio commentaries. Of particular interest is the CGI featurette, which reveals the effects used for more extreme scenes (the ant hallucination, the hallway fight) and more subtle ones (color correction, double-focus shots). Also here is a collection of Cast and Crew Interviews (11 clips, 41:13 total) featuring director Park Chan-wook (above right), writer Tsuchiya Garon, and actors Choi Min-sik, Yoo Ji-tae, Gang Hye-jung, Yoon Jin-seo, Chi Dae-han, Kim Byoung-ok, Oh Dal-su, Oh Gwang-rok and Lee Seung-shin. Most of the interview footage was shot after production, though many clips also feature additional behind-the-scenes footage and thoughts from the director. Not surprisingly, many of the cast and crew members had already worked with Park on other film-related projects. Next up is a solid collection of Deleted and Alternate Scenes (10 clips, 24:54 total), including "Oh Dae-su", "Day One", "Japanese Restaurant", "Fight with the Guards", "The Kiss", "The Lovers 1", "The Lovers 2", "Woo-jin's Preparation", "The Remaining Plot" and "Subway Station: Reflection", featuring optional audio commentary by the director. These are presented in rough but finished form and are all worth a look; additionally, Park's comments make it clear why these bits of footage were left on the cutting room floor. The second disc concludes with a short featurette, "Le Grand Prix at Cannes" (8:49, below left), featuring thoughts from the cast and crew about their whirlwind tour of the famous festival. They remain humble about the film's achievements, happy that their work was recognized internationally. 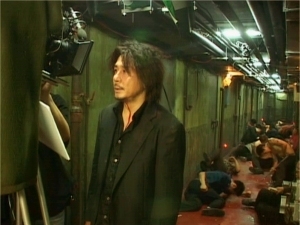 Disc Three is for serious fans only, as we're presented with the Autobiography of Oldboy (3:29:20, below right), a fly-on-the-wall perspective of the film's production. Divided into month-long chunks from May to September 2003, this "video diary" features plenty of behind-the-scenes footage that fans should enjoy. Unfortunately, it's not presented in any particular context---and without narration or structure of any kind, the footage sort of bleeds together after awhile. Though it borders on overkill---especially since many of the stories have already been told during the commentaries and featurettes---most ardent fans of the film should enjoy browsing this chronological cornucopia of footage. As mentioned earlier, a pair of additional extras is also tucked inside the metal tin. Included here is an original 35mm Film Cell mounted on double-sided cardstock, but of greater interest is the complete first volume of the original Oldboy Graphic Novel (212 pages total). Newly translated into English, this softbound book still retains the original right-to-left layout, along with a handy reminder for those unfamiliar with manga. Like the recent Sin City: Recut DVD release, this companion book also allows viewers to follow along and see what story elements were changed, omitted or left intact. All bonus features are presented in 1.33:1 and non-anamorphic widescreen aspect ratios, paired with non-removable English subtitles when appropriate. Apart from the film's original theatrical trailer (which was included with the Region 2 Special Edition, if not other releases as well), all the bases seem to have been covered extremely well. Though only a select few will dig through every nook and cranny, you can't say that Tartan hasn't packed this three-disc set to the gills.